Chart-stopping superstars under one roofDon't miss tweets from your favorite stars! Some of the biggest CMA artists are tweeting tonight, watching the CMA Fest on ABC right along with you. Follow along during the show to see what they're thinking, and leave comments below to join the conversation. If you want to ask the artists questions, tweet from your own Twitter account and add #cmatv to the end of your post. Then come back here to see their answers! Twitter "tweets" are text messages of 140 characters or less, usually sent from someone's phone wherever they happen to be. Tonight’s biggest show is “CMA Music Festival: Country’s Night to Rock,” which starts at 8 and runs three hours on ABC. 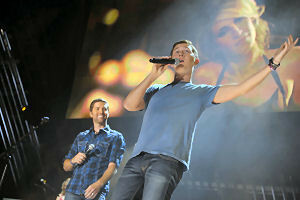 “American Idol” fans, take note: This year’s winner, Scotty McCreery, will perform, and so will runner-up Lauren Alaina. There will be performances by Trace Adkins, The Band Perry, Dierks Bentley, Sara Evans, Lady Antebellum, Little Big Town, Miranda Lambert, Rascal Flatts, Reba, Darius Rucker, Blake Shelton, Sugarland, Taylor Swift and Keith Urban. The special offers collaborations as well: Alabama and Brad Paisley; Jason Aldean and Kelly Clarkson; Kid Rock and Sheryl Crow; Josh Turner and “American Idol” victor McCreery; “Idol” runner-up Alaina and Martina McBride; Gretchen Wilson with Big & Rich; and Alan Jackson with Zac Brown Band. The program also supplies interviews with The Band Perry, Aldean and Clarkson, Lady Antebellum, Swift, and Shania Twain.